Dunn's Marsh e-News: Events! News! Opps! The DMN e-News and an occasional hard copy DMN News are published by the Dunn’s Marsh Neighborhood Association (DMNA) on an “as-needed” schedule. The Dunn’s Marsh Neighborhood Association, Inc. has been working to unite neighbors to solve mutual problems and promote fellowship among neighbors since 1973. Friday, Sept. 24, 10 am-noon – Senior Adult meeting and free brunch. Boys & Girls Club, 4619 Jenewein Road. Tuesday, Sept. 28, 7 pm – Hear Arboretum representatives describe how the Verona Road project will affect the Arboretum, Prairie UU Society, corner of Crawford and Whenona. Free Monona Terrace events – Several dates in October. See article 14. Sat., Oct. 9, 9:30 am – Neighborhood Chicken Coop Tour. Meet in front of Prairie UU Society, corner of Crawford and Whenona. Wed., Oct. 13, Public Hearings on the Supplemental Draft Environmental Impact Statement for the Verona Road/Beltline Reconstruction project. 12 noon-3 pm at Boys and Girls Club; 6-9 pm at Cherokee School. Book Discussions – Many dates. See Article 12. Thursday, Oct. 21– Dunn’s Marsh Neighborhood Association Social and Annual Meeting. 6:30 pm for chili & dessert social, 7 pm sharp for meeting. Prairie UU Society, corner of Crawford and Whenona. 3 - Do You Have Chickens? 5a - Survey: Did Your Household Get a Notice About the Verona Road Hearings? The Boys and Girls Club (BGC) is working to create activities for senior adults. Attend a meeting at BGC to learn about suggested activities and to suggest others. The date is this Friday, September 24, from 10 a.m. until noon. A brunch will be served. In San Antonio, TX, it’s common to wake to the sound of roosters crowing at the break of dawn. Although that’s not true here in the Dunn’s Marsh Neighborhood, don’t kid yourself, chickens are being raised here. What’s more, they are legal in small numbers as long as a rooster isn’t among them. Are you curious about the neighborhood chickens? If so, join your neighbors on Saturday, October 9, on a walking tour of neighborhood chicken coops. The tour group will meet in front of Prairie UU Society, corner of Whenona and Crawford promptly at 9:30 a.m. The Dunn’s Marsh Neighborhood may have more residents raising chickens than our Chicken Coop Tour Guide knows about. If you raise chickens, but haven’t been contacted about the October 9 tour, please contact Jo Kelley. 276-8010 or jokelley@tds.net <mailto:jokelley@tds.net> to learn about the tour. You can then decide if you want to have your installation be a part of the tour. The Verona Road/West Beltline Supplemental Draft Environmental Impact Statement (SDEIS) has been published and is available within the neighborhood, at the Fitchburg City Hall, at some local library branches, and on the DOT website. It’s something you will definitely want to take a look at before the public hearings, scheduled for October 13, 2010. The place in the neighborhood to find it is at Faouzi’s Restaurant on the Beltline Frontage Road – 4245 West Beltline, the old Blarney Stone. Ask at the counter to see it or sign it out. Hopefully, most people will take the time to look at it right on the spot so that it can be available to others. Additional copies are at local library branches. The Meadowridge Branch on Raymond Road and Monroe Street Branch down near the stadium both have copies. Ask at the reference desk. Although the DOT website says that Sequoya Library (near Midvale and Tokay) has a copy, when I called yesterday, they looked and found only the 2004 EIS. Scroll down to the middle of the page to where it says Supplemental Draft Environmental Impact Statement (SDEIS) (Posted September 22, 2010). This section of the website also lists 9 public libraries that are supposed to have hard copies. David Liebl, from the UW Arboretum, will speak on how the Verona/Beltline Road project will affect the Arboretum. The meeting will be at 7 pm, Tuesday, Sept. 28, at Prairie UU Society, 2010 Whenona Drive. Neighbors and friends who want to know about this prior to the public hearing should attend the meeting. Two formal hearings will be conducted about the Verona Road/West Beltline Reconstruction project on Wednesday, October 13. One hearing will be from 12 noon until 3 pm at the Boys and Girls Club on Jenewein Drive in the neighborhood. The other will be at Cherokee Middle School, 1301 Cherokee Drive (just off Midvale) from 6-9 p.m. that same day. People are urged to look at the Supplemental Environmental Impact Statement beforehand. It is a thick 2-volume set of descriptions of what’s planned and the predicted impacts from the reconstruction. Check the previous article for places to find the SDEIS. 5a – Survey: Did Your Household Get a Notice About the Verona Road Hearings? The brochure is 8 ½ x 11 inches with a blue masthead containing the WDOT symbol. A map of Stage 1 and 2 improvements is located on the bottom right hand side of the front page. It’s that time again – time for the annual meeting of the Dunn’s Marsh Neighborhood Association. It’s a chance to learn more about initiatives in the neighborhood in the past year, an opportunity to bring up ideas and concerns, and a time to volunteer to work with the DMNA in the coming year. This year it’s also a time to socialize and eat beforehand. The doors will open at 6:30 on Thursday, October 21 at Prairie UU Society, 2010 Whenona Drive (corner of Whenona and Crawford). Residents arriving at this time will be rewarded with a cup of President Jeff Glazer’s prize-winning chili and assorted other sweet treats. The meeting itself will start at 7 p.m. sharp. It is hoped that all the “paperwork” that goes with the annual meeting will be out of the way before the 7 p.m. starting time. Paperwork consists of signing in, indicating whether you wish to be considered a DMNA member for the coming 2010-2011 year, and checking out the minutes of the 2009 annual meeting and any assorted maps and other displays. Special this year will be the appearance of several guests representing organizations that serve the neighborhood. We hope to have Susan Corrado to talk about the Allied Wellness Co-op, Michael Johnson who is the new director of the Boys and Girls Club, and Dora Zuniga representing Big Brothers Big Sisters. Very BRIEF reports from DMNA Committee chairs will be followed by a half hour open floor discussion where Dunn’s Marsh Neighborhood residents can bring up concerns and ideas for bettering the neighborhood. 4. Belmar - the entire Fitchburg portion of the neighborhood from Thurston Lane south to Crescent Road.and along Seminole north to Sentinel Pass and also including the Renaissance development west of Red Arrow Trail and the the streets west of Marlborough Park. If an area does not choose its quota of 3 representatives, additional representatives from any area will be selected by all the voting members at the annual meeting. However, if an area chooses no reps, a space must be left for at least one representative from that area. A total of twelve Council members will be chosen at the meeting. Officers are selected by the Council from among their number at the first Council meeting after the annual meeting. In provisions added to the DMNA bylaws last year, these are the expectations of Council members: to attend DMNA meetings; help with DMNA work such as distributing newsletters, joining a committee, contacting officials, and/or attending hearings; willingness to have name and contact information published in neighborhood communications and websites; and adherence to the bylaws of the DMNA. Dora Zuniga from Big Brothers Big Sisters gave a brief presentation at the September 21 DMNA Council meeting. She especially highlighted the opportunity for volunteers to mentor a child at Cherokee Middle School in the Big Brothers Big Sisters “School Friends” Program. This program allows the volunteer to get his or her feet wet in the BBBS program by working with and socializing with a Cherokee middle schooler for an hour once a week right at school. Big Brothers or a Big Sisters can make all the difference in the world in the life of youngsters. The “Littles” can learn to model themselves after a responsible, loving adult. Little Sisters and Little Brothers experience adults who can “be there” for them. The “Bigs” introduce their Littles to worlds they might never otherwise have access to. Dora Zuniga plans to be one of the presenters at the DMNA annual meeting on October 21, 2010. See the special article about the meeting for other details. The DMNA’s request to the city of Madison for painted bike lanes on the Beltline and Verona Frontage Roads will be at least partially honored next year. In response to the Association’s request and nudged by 10th District Alder Brian Solomon, Mark Winter sent an e-mail on September 9 detailing bike lanes on both sides of Verona Road. He said, “Marking the bike lanes along the Frontage Rd from Seminole Hwy to Atticus Way as well as Hammersley Rd from Whitney Way to Home Depot is planned for next year. This year’s funds are already accounted for. Other facilities such as bike boxes (probably not RED though) will be included as appropriate.” The DMNA had asked for the lanes to extend all the way to Red Arrow Trail which is the next street beyond Atticus Way. Atticus Way is the street that leads to Avalon Village and Walgreen’s. 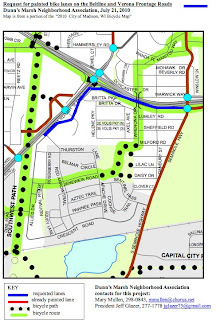 At its September 21 meeting, the DMNA Council authorized a request to put bike route signs on the route from Atticus Way west to the sidewalk near the head of Allied Drive that leads to the Southwest Bike Trail and then further along Verona Road and eventually to the Military Ridge Bike Trail. In a e-mail sent on September 22, the DMNA also asked Winter to clarify if “marking the bike lanes” means painting the lanes as was requested. 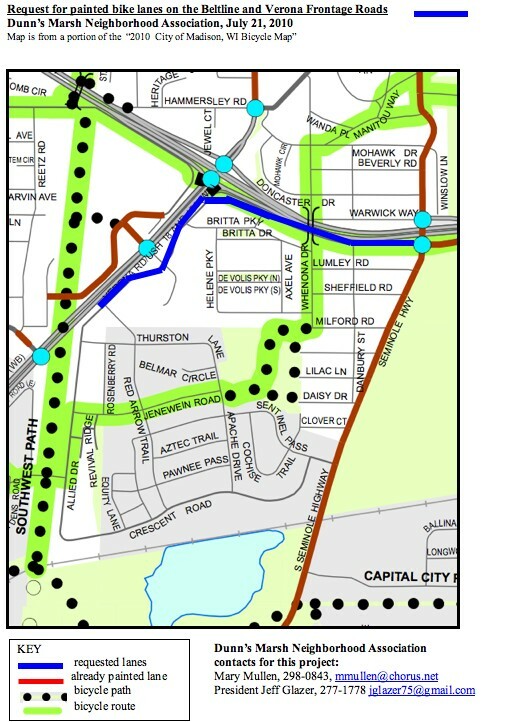 The purpose of these requests is to make biking safer and also to make sure bikers know efficient routes to connect to the named, more lengthy bikeways. The new handicap path from the lower (easternmost) leg of the Marlborough Park path to the shelter and then onto the upper path has been completed. The new blacktop looks great. As the long days wane to equal time for light and dark, the gardens in the park are in their final stages. Sunflowers stand like giants and some amazingly tall corn still waves in some gardens. Butterflies are enjoying the flowers. By the end of October all the fences and stakes should be out of the plowed garden. Gardeners using the no-till gardens that are southernmost in Marlborough Park do not have to remove anything from their gardens. This summer conditions have improved after complaints drew orders from the Madison Real Estate Department. Volunteers were tapped to take care of litter and garbage on a weekly basis, and more mowing was done as well. Crime report maps, updated weekly, are available online. Sample what they look like by clicking on the attachment. The document also tells you a lot about the information that appears on the map. Go to www.crimereports.com <http://www.crimereports.com> to sign up. It’s also easy to compare our neighborhood to others using the map since one can scroll north, south, east, and west and can also enlarge or make the scale of the map smaller. Astute viewers will notice some labeling mistakes on the map. For example, it labels and shows the Renaissance development as “Dunn’s Marsh Park.” It also calls the Belmar (Fitchburg) area of the neighborhood as the “Allied Community.” Previous attempts to get Google to correct the map have been unsuccessful. Phosphorus (or P for you chemists out there) is important for the growth of plants. It is commonly found in lawn fertilizers. It is also found in the beautiful fall leaves that homeowners rake each autumn. It is possible to take advantage of this nutrient by mulching the leaves with your lawn mower, then either leaving them on your lawn, raking them into your gardens, or tossing them into your compost bin for use next spring as fertilizer. If you have too many leaves to use on your own property, then rake them to the terrace for city crews to collect (or haul them to the yard waste collection sites). Please be careful they don’t end up in the street – they can clog storm drains that could lead to flooding. They may also end up in our lakes, providing nutrients for weed and algae growth. The leaves don’t even need to move from the street to cause problems. As storm water flows through a pile of leaves, it creates a nourishing “leaf tea” for unwanted weeds and algae. It is good to appreciate the beauty of fall leaves on the trees, and wise to appreciate their potential contribution of nutrients for your lawn and garden. It is also important to appreciate the negative impact they may have to the quality of our lakes. Remember: Love your lakes, don’t leaf them. For more information, or for a Love Your Lakes, Don’t’ Leaf Them yard sign, go to www.myfairlakes.com <http://www.myfairlakes.com> . OK, that’s a long introduction to an article about several book clubs to choose from, both in and near our neighborhood. Let me first put in a plug for the Prairie Book Club which meets once a month right at Prairie UU Society in the neighborhood. It’s an open, drop-in book club which you may attend even if you haven’t completed the book or don’t belong to the church. This is a book club for readers who are interested in a wide variety of books. both fiction and nonfiction, some current best-sellers, some on current topics, some by local authors, but all available in paperback. Books are selected for the next few months by the members several times a year. It meets on Sundays, starting about 11:45, and attendees bring finger food or a dish to share. Sunday, Oct. 17 – Now and at the Hour, a fiction book by local author Martin Drapkin, is the story of 3 people who meet in Ward B of a state institution: a 12-year-old with a football brain injury, a 54-year-old man with cerebral palsy, and a young aide. The author will attend this discussion, and the book is available for $6 through the book club. Sunday, Nov. 21 – River of Doubt: Theodore Roosevelt’s Darkest Journey, a nonfiction book by Candice Millard, is about Roosevelt’s journey to the Amazon after his defeat for a third term. Sunday, Dec. 19 – White Like Me : Reflections on Race from a Privileged Son , by Tim Wise, is a personal account of how the author became aware of white privilege and racism. Sunday, January 16 – Rabbit Redux is a novel by John Updike that takes place in 1969 when the nation was in chaos (Vietnam War). Major characters are Harry “Rabbit” Angstrom, working a dead-end job in Pennsylvania, his 12-year-old son, an African American Vietnam vet, and a wealthy white teenage girl. Every so often a book comes along that does more than gets people reading … it gets them talking! And that’s exactly what The Immortal Life of Henrietta Lacks by Rebecca Skloot does. Skloot recounts the little-known story of the origin of the “HeLa” cells, which have directly aided many advances in modern medicine. The story of Henrietta Lacks, the poor African-American Southern tobacco farmer and cancer patient who was the unwitting donor of the cells, will provoke discussions on issues related to bioethics and diversity. Plan to attend author Rebecca Skloot’s lecture on the UW-Madison campus on Monday, October 25, 2010, free at the Kohl Center, 7 p.m. While many discussions are located on the UW campus, several are at nearby public library branches, including two that serve our neighborhood. Thur., Nov. 18, 6:30 p.m. – Monroe Street Branch, 1705 Monroe St. Most public library branches have book discussions. Here are some discussions at the branches closest to the Dunn’s Marsh neighborhood: Sequoya on Midvale Boulevard and Meadowridge in the Meadowood Shopping Center. If mysteries are your genre, check out the Sequoya’s books and discussion, 7-8 pm on the first Wednesday of the month. Wed., October 6 is Erin Hart's book Haunted Ground. If you just want to talk about any books you’ve read lately, try the third Monday, 7-8 pm at Meadowridge. Are you free during the day? Then Thursday afternoons at 1 pm at Sequoia might be your choice. Various types of books up for discussion at Sequoya. Thursday, October 28, is Blame by Michelle Huneven. It’s “a spellbinding novel of guilt and love, family and shame, sobriety and the lack of it, and the moral ambiguities that ensnare us all” according to the publicity. 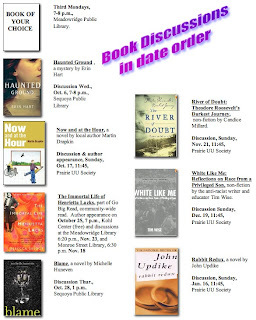 To access details about the books and discussions, go to the Madison Public Library Program Calendar - http://host.evanced.info/madison/evanced/eventcalendar.asp?ag=&et=&dt=mo&df=calendar&cn=0&private=0&ln=ALL <http://host.evanced.info/madison/evanced/eventcalendar.asp?ag=&amp;et=&amp;dt=mo&amp;df=calendar&amp;cn=0&amp;private=0&amp;ln=ALL> Make your search easy by clicking on the Search button and choosing the Locations, Event Type, and Age Groups you’re interested in. Are you considering returning to school? Each semester, UW-Madison's Adult and Student Services Center offers grants to provide financial assistance to adults who have experienced a significant break in their formal education and are entering UW-Madison on a less than half-time basis. The funds are provided by tax-deductible contributions made by organizations and individuals to the UW Foundation Continuing Education Fund. Resident tuition grants for one class, up to five credits, for undergraduates and special students and one class, up to three credits, for graduate and capstone certificate students for the fall and spring semester. Resident tuition grants for one three credit course in the Summer Session (excluding the Three Week Intersession) for undergraduate, graduate, capstone and special students. An individual may receive the grant a maximum of two times. The recipients of the Continuing Education Grant will be selected primarily on the basis of financial need, clearly expressed educational goals, and significant interruption (usually five years or more) in formal education. The balancing of such factors as the number of degrees already completed, length of interruption in education, proximity to completion of educational goal, recent academic performance and other indications of potential academic success at UW-Madison, etc. will result in the allocation of grants as funds allow in any given semester. For more information about the criteria, deadline or to apply please visit http://www.dcs.wisc.edu/info/finanserv/ce-grant.htm. You can also call 608-263-6960 or email me, the grant coordinator, at amchugh@dcs.wisc.edu with questions about the grant information on the website. Please note the deadline for the spring semester is November 1, 2010. Madison is a haven for free high-quality cultural events. We’re the envy of more rural and less forward-thinking areas. Here are the free October events at Monona Terrace, the convention center on Lake Monona. Full Speed Ahead After 50/5 For 5 Walk on Wed., Oct. 6, 9-11 am. Includes information booths. Outside if weather is good, in Exhibition Hall if inclement weather. Tunes at Monona Terrace Features the Don Peachey Band on Wed., Oct. 6, 5:30-7 pm. in Exhibition Hall. Come to listen or dance to polka music. Parking is $4. Wright Lecture Series “Buildings We Love to Hate” on Thurs., Oct. 7, 7 pm, Lecture Hall. Moon Over Monona Terrace is a chance to look at the moon and other celestial objects through the powerful telescopes provided by members of the Madison Astronomical Society on Friday, Oct. 14, 7-9 pm, on the rooftop. Family Concert – Richie’s House of Jazz featuring Richie Cole and Five By Design on Wed., Oct. 27, 7 pm in the Madison Ballroom. 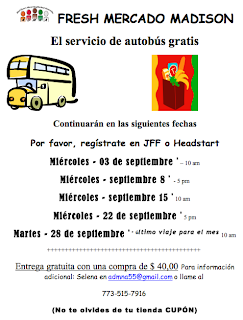 Wed., Sept 8, 5 p.m. – Free bus ride to Fresh Madison Market. 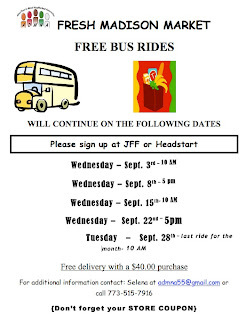 Wed., Sept 15, 10 a.m. – Free bus ride to Fresh Madison Market. Consult Article 1 for additional dates. 8 - Sold on Native Plantings? You Could Sponsor One on the Fitchburg Library Site. All through the month of September, neighborhood residents can ride a bus for free down to the UW campus area to shop at the Fresh Madison Market grocery store. 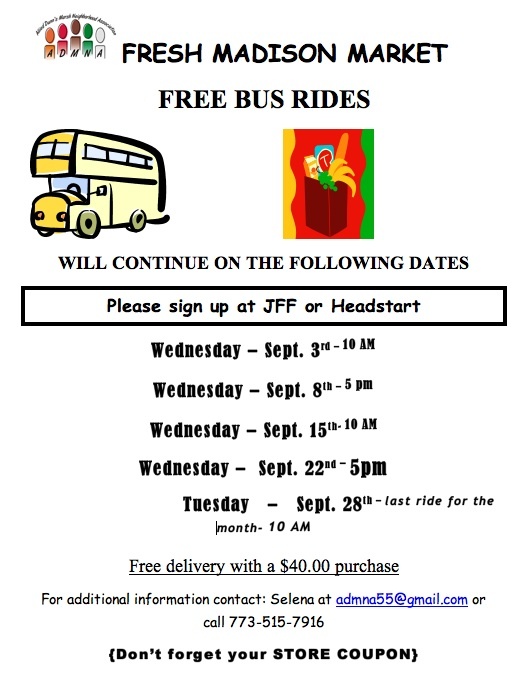 These rides happen mostly on Wednesdays as follows: Wednesday, Sept. 3 - 10:00 a.m., Wednesday, Sept. 8 – 5:00 p.m., Wednesday, Sept. 15 – 10 a.m., Wednesday, Sept. 22 – 5 p.m., and Tuesday, Sept. 28 – 10 a.m.
Groceries are delivered free with a $40 purchase. For additional information, contact Selena at admna55@gmail.com or call 773-515-7916. Sign up for a ride at Joining Forces for Families on Allied or Headstart on Red Arrow Trail. When big machines pull up and start making holes in the ground, neighbors tend to come out and ask what’s going on. What was going on August 17 at the corner of Danbury and the Frontage Road and also down a couple of blocks at Sheffield was the laying of a fiber optic cable for Department of Transportation communications use. CCI System Cable Construction, Inc. had previously worked at the corner of Clover and Seminole Highway. The worker directed my attention to an orange tube on the Beltline side of the Frontage Road and another coming out of the hole on Danbury. He noted that a 96-strand thumb-sized cable from both tubes would be connected. The tiny fibers are melted together to make a connection. I believe the worker also pointed out that this DOT cable was connected to the cameras that monitor the Beltline traffic in our area. Back to the neighborhood. Does it help to go out and talk to the company doing the work if you have fears about what they are doing and wish for a change of plans? Absolutely! The foreman I talked to explained how the cable installation company had moved the cable box to the north side of Clover because the neighbor on the south side was worried about how the box would affect a beloved tree. There you are biking merrily along on the Frontage Road after turning into the neighborhood from Seminole Highway. There’s a nicely painted bike lane. Then, a while after the road turns from a 3-lane to a 2-lane, a sign looms that says “Bike Lane Ends.” Help! What are you supposed to do, jump off your bike, jump the curb, and get on the grass? Well, not exactly. Bicyclists can ride on any local street including frontage roads. But the point is that signs like “Bike Lane Ends” can be confusing. In addition, when a bike lane simply disappears, the protection that it affords goes away with the lack of lines. Considering this issue, at its July 20 meeting the DMNA Council authorized communicating with the city about painting bike lanes along the entire Beltline and Verona Frontage Road. A letter and map were drafted and forwarded to City of Madison staff member Mark Winter. In a conversation prior to the Council’s request, Winter was quite positive about the likelihood of getting the lanes painted if the DMNA requested them. He said the road was two feet narrower than the standard road that would have painted lanes but said that neighbors could appear before the Bicycle Pedestrian Committee to support the lanes even if city staff might recommend against them. FYI, there are painted lanes on the Frontage Road east of Seminole Highway as well as on Seminole Highway on both sides of the Beltline. Years ago it was an uphill battle to get the lanes painted on Seminole. Why? Because the powers that be expected everyone to go through Nakoma and across the Beltline by way of the pedestrian overpass. They finally recognized that no biker headed out Seminole Highway to Paoli would ever detour to the overpass, and those lanes have been there ever since. We haven’t heard anything yet about the recent Frontage Road bike lane request, either pro or con. Keep tuned. Check out the attached map to see details. On the map, the route of the requested lanes is dark blue. The cacophany of grading machines and gravel trucks has drowned out the ordinary sounds in Marlborough Park lately. What’s been happening there? 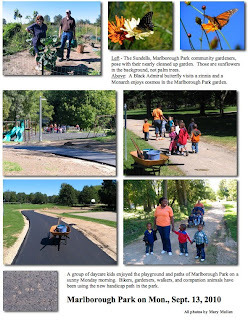 Answer: a new blacktop path in the park. The new path snakes from the lower bike path, around the shelter, and then to the upper bike path. It is meant to be a handicap path that will make it easier for those in wheelchairs or perhaps parents or kids pushing strollers to get to the shelter and back. The path also has a tie into the playground. With all the problems of illegal and unwanted motorized traffic in the park, one may wonder if this path will just create more problems, but the curved layout is meant to discourage this kind of use. 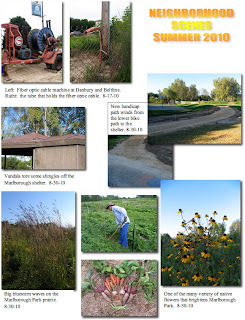 DMNA President Jeff Glazer recently got our Dunn’s Marsh Neighborhood Association website up and running. Getting Secretary Solare O’Brien to nudge her dad, former DMNA President Dan O’Brien, to pass on the password helped, and the rest is history. So far the new DMNA site is just in its infancy. It contains a short welcome, a list of the Neighborhood Council members, and copies of the monthly agendas since December 2009. If you are lucky enough to have the latest Microsoft Word version or can download a converter, you’ll be able to look at agendas. A trick is to click on the box and then hit the download link. You may be prompted to download a converter so that you can see the docx agendas. At its July meeting, the Dunn’s Marsh Neighborhood Council learned that new officers have been chosen by the Allied Dunn’s Marsh Neighborhood Association. The new president is Selena Pettigrew and the new vice president is Sina Davis. This neighborhood has been concerned about problems related to alcohol and drugs. Witness the turnout from the neighborhood before the Madison Alcohol License Review Committee (ALRC) when two establishments on the Beltline Frontage Road applied for licenses starting last winter. Well, Dunn’s Marsh neighbors aren’t the only ones with concerns. There’s actually a Dane County Coalition to Reduce Alcohol Abuse. The Coalition got really active when a number of Walgreen’s stores applied to the ALRC. This self-assessment was developed at San Diego State University originally for colleges and universities. UW Madison has one for its students. It has proven to be so soundly researched and effective, that an additional version was built for communities. The Dane County Coalition is the second coalition to take advantage of this; the other was a county coalition in Maine. The Coalition is advertising it in their full-page ad in the back-to-school edition of The Onion (9/3) and in full-page ads in the first two editions of The Badger Herald (9/2 and 9/3). The Coalition will receive statistical information, but nothing is ascribed to any individual person. This is a well-researched resource. We encourage Dane County residents to take advantage of this opportunity. By the way, coming back to the Dunn’s Marsh Neighborhood, here’s what happened because of neighborhood opposition to liquor licenses. The ALRC sent both applicants back to develop better plans. Neither one provided new plans and neither has received a license. However, Faouzi’s Restaurant, at 4345 West Beltline has opened as a restaurant that serves food only. Neighbors who’ve eaten there have raved about the good food. The landscaping plans for the Fitchburg Library have incorporated 5 stormwater rain gardens and several native prairie areas. The current plans are that these will be planted by contractors next spring or summer after the Library is built and the final grading completed. If you or any organization you're involved with would be interested in sponsoring the planting and/or maintenance of one or more of these native plant areas, please feel free to let me know and I can get you in touch with the appropriate contacts. We probably all know people with diabetes. The disease is rampant these days. Knowing a family member with diabetes is to know some of its insidious effects and all the ways diabetics try to control them. Because of my mother’s diabetes, I became familiar with many of the issues and procedures to try to control its effects. These ranged from diet and exercise to insulin shots, surgery to improve circulation to her feet, and amputations. One can feel helpless, but there is something anyone can do: help raise money for more research. This year’s walk to fight diabetes – the 2010 Step Out - is scheduled for Sunday, October 10. Step Out organizers are expecting to raise $60,000 and have more than 500 walkers and volunteers come together at Vilas Park. The Planning Committee is also working hard to create a fun and memorable event and we would love to have you join them this year. <http://www.diabetes.org/stepout> or call Barb Folco at 608-222-7785. Planners of 2010 Step Out would like to offer up a challenge to all the Madison Neighborhoods Associaions to see which group can get the most people to participate in this year's walk and to see which group can raise the most money. Not only will this be a fun way to get to know the people in your neighborhood, it will also be helping out your neighbors dealing with diabetes on a daily basis. Contact Barb Folco at 608-222-7785 if you have questions or need assistance in get a team set up. Editor’s Note: Women are more in the news than they used to be. Check out how many of these women you know who were in the news in September or who have September birthdays. I only knew 10 of the 23. How about you? Sept 20, 1946 - Judith Baca, Latina visual artist and muralist; community activist. A year-round women's history calendar is available on our website www.nwhp.org <http://www.nwhp.org/ <http://www.nwhp.org/> > in the News and Events category. Edible Landscaping / Fruits and Nuts: A small victory was achieved last Wednesday at Parks Commission, as Commissioners passed an MOU policy that replaced the fees and insurance that was previously going to be required. This victory may prove to be temporary because Alder Skidmore (District 9) brought the decision to the city attorney for a double check. I remain 100% supportive of edible orchards in Madison and, honestly, remain stunned that we’re not doing everything in our power to clear a path for them throughout the city. I’ll keep working to support these in Marlborough Park, in Wingra Park, and everywhere else we can. For more information on the Parks Commission action, check out this article: http://host.madison.com/ct/news/local/govt_and_politics/city_hall/article_5830a434-905f-11df-8139-001cc4c002e0.html <http://host.madison.com/ct/news/local/govt_and_politics/city_hall/article_5830a434-905f-11df-8139-001cc4c002e0.html> . And don’t forget to keep voting: http://www.madisonfruitsandnuts.org/ <http://www.madisonfruitsandnuts.org/> . I’m joining a couple alders and city staff for a meeting in August to further discuss. Plastic Bottle Recycling: We can now recycle lids and caps from plastic bottles. They must be ON THE BOTTLE to be recycled. Step one: Buy less plastic. But if you have to, then proceed to Step 2: Empty bottle. Step 3: Give ‘em a little squeeze to let some air out. Step 4: Reattach lids or caps. Step 5: Throw in your single stream recycling, alongside mixed paper, aluminum, steel, and glass. Central Library Public Meetings: Hmmm. This has been an interesting couple weeks, with the State Journal reporting that the library project is being radically downsized and Mayor Dave responding that they’ve lost their minds. Regardless, we are moving forward on something, and the first step was taken at our council meeting last night, where we approved forward movement on some initial design and planning work. As part of this, there will be several public meetings. If you have any interest in the redevelopment of the central library, please attend! City Development Process / Neighborhood Summit: Another brain teaser. First the Mayor and development interests get upset that a huge, controversial, shoreline hotel project, requesting $16 million in taxpayer assistance, in a historic district proves to be, well, controversial. It passes anyway. Then everyone starts screaming that the process is broken. DMI issues a series of recommendations (http://www.downtownmadison.org/uploads/media/Development_Approval_Recommendations_062510_final.pdf <http://www.downtownmadison.org/uploads/media/Development_Approval_Recommendations_062510_final.pdf> ). The Mayor says fixing our broken approval process is the biggest economic development priority for the next year. Meanwhile, unemployment in Madison hovers above 6% (twice its normal rate; but not even factoring underemployment or those who have given up completely). Foreclosures remain high. Homelessness remains high. Thousands of Madisonians are completely isolated from the economic mainstream and 50% of Madison public school students qualify for federal free or reduced school lunch. But I digress. Back to the aprpoval process, which looks to silence (or at least diminish) the voices of neighborhoods. I believe the active engagement of our neighborhoods represent democracy in action. I believe they are part of what makes Madison great. Highlander Motel. Madison Police and the City Attorney’s Office have been working hard to deal with the Highlander, which has 700 police calls in the past two years. The goal was to use chronic nuisance to force closure and a change in ownership. The court, however, ordered an “undertaking.” Am outside management company will be hired by August 5, 201. Cameras will be required at all exits. All residents will be run through CCAP monthly. A roster of residents will be sent to police every two weeks. A $5,000 lien will be placed on the property of these actions aren’t taken. Finally, the Highlander will close January 31, 2011. What happens from there is uncertain. I remain concerned that places like the Highlander are often the only option other than homelessness for many Madisonians. In other words, they provide a vital public service. But 700 police calls is not acceptable and I think this is a good resolution. I am thankful to the City Attorney’s Office and Madison Police for their great work.